This quilt is made out of one kind of fabric, the one that goes around in the border. I got this bright colored fabric more then a year ago at Quilts 'n Calicoes, a lovely shop in Singapore.The owner, Ira Joseph, is a wonderful woman and skilled quilter. Once you enter her shop it feels like being in a candy store, so many colorful fabrics to choose from! With the Stack and Whack way this colorful quilt was born. The pattern is from the book: One Block Wonder by Maxine Rosenthal. Every time I worked on this quilt I was struck by the effect of rearranging the triangles. Working on this one was such a joy; I almost did not want it to be finished. I hand-quilted it with a multi-colored thread, first along the ditch, and then again with circles at the corners where three blocks meet. It took a while before I found another project that was as much inspiring to me as this one. A very nice quilt, also the way you made it is special. 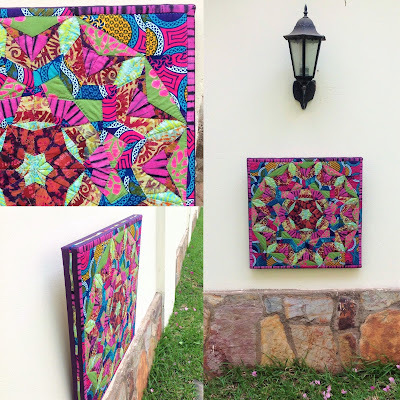 When you see this colourful quilt it makes me happy! Spetter is the chief quality control manager. @Gina: muito obrigada!! I have entered Spetter on the quilt to the quilt show you mentioned with the title: "Can I have a cookie? Please?? I love your One Block Wonder! Gorgeous - so colourful! Wonderful for me to meet another Dutch quilter. You do lovely work. I love the quilt and by the looks of it so does spetter. Fabulous quilt and Spetter is so cute on it - thanks for entering. Your quilt is beautiful I love the colors! And your pup is adorable, thank you for sharing! Hilde -- so nice to "see" you on your blog! I'm Sue Levis -- from Orefield, PA. It's been a while but I still remember you very fondly. We had fun times together in Singapore. Are you now living in Sao Paulo? We used to live there too -- 1980-84. That quilt is amazing, and the mini Schnauser is cute too. Just when you think you have seen every stack and whack imaginable - you find one that is just AMAZING. This is very - very cool!! Your subtle use of value is really pleasing - but gosh - we just can't have enough pattern in our lives can we??? Thank you so much for sharing! I have one of these fun quilts on the go right now. Mine doesn't match my dog as well though. Love how colourful yours is! 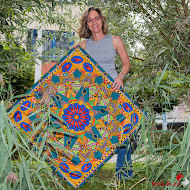 Those colors are amazing, Spetter knows what to do with a beautful quilts. I have the same problem with one of my dogs. I wanted her to be in the contest, but the second she sees that camera, she's gone. Your quilt is gorgeous. Your dog looks so cute. Thanks for sharing. Love the way the stack and wacks and the border compliment each other. 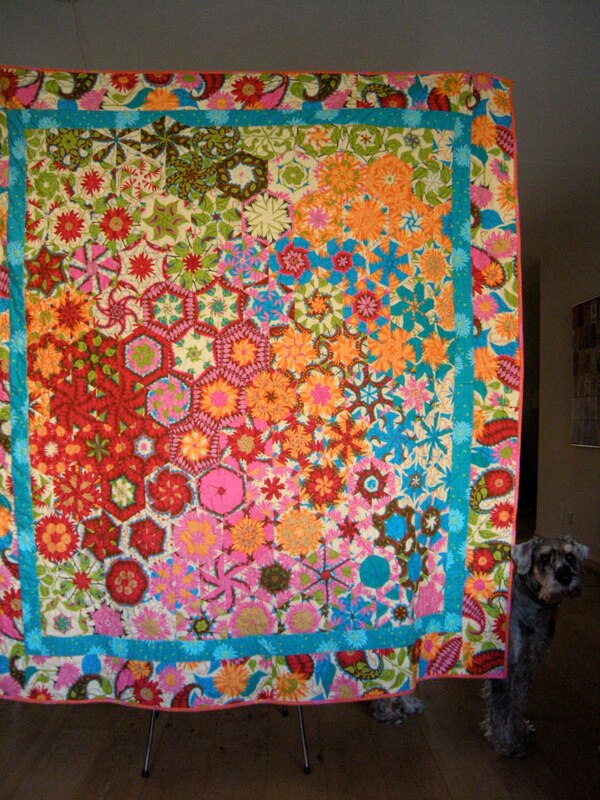 Great quilt, with a beautiful and camera-brave poochie. Wow! Love the colors and the pattern of this quilt. Spetter is cute. I love this quilt. The pattern, the colors - it is just brilliant. Your doggie is adorable too! Hi Hilde. Came across your blog via Vreni's blog. This quilt is exquisite! I hope it takes pride of place somewhere special. 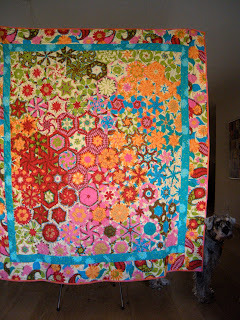 HI Hilde Really like this quilt as the fabric works so well and love the colours. Is it out of one fabric? My quilt is up on my wall!